In the Upper Prep, there is a convivial atmosphere of friendship and purpose. Our boys continue their journey of all-round enrichment and learn to think independently so that they are prepared for the move into our Senior Years. We build each child’s confidence by giving them a strong academic platform, together with important life skills, that will enable them to grow in self-belief and help them achieve their full potential. 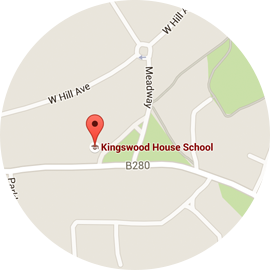 There is a philosophy at Kingswood House of educating the whole child, nurturing confidence and developing self-esteem. Pupils are encouraged to enjoy their learning and develop their skills in a calm environment of intellectual curiosity. Our teachers are talented, dedicated and caring professionals who bring learning to life and inspire their charges by plentiful use of encouragement and praise. In the spirit of inclusion, children of all abilities are suitably challenged and sensitively supported in their thirst for knowledge. We believe in small classes, with a maximum number of eighteen pupils, and each year group is typically divided into two streams with discrete sets for mathematics. Although the form teacher remains an important influence, and maintains an overview of each boy’s academic and pastoral well-being, subject specialists are increasingly introduced from Year 5 onwards. The years in Upper Prep provide an environment specifically designed to enhance teaching and learning. The 11+ Common Entrance syllabus starts during Year 5 and continues through Years 6, 7 and 8. It provides an excellent preparation for GCSE across all subject areas and ensures a commensurate level for our own Senior Years or alternative destinations. The headmaster meets with all parents during the spring term of Year 5 to provide an overview of each child’s progress and discuss suitable options for the future. Whilst it is our expectation that most boys will move seamlessly into our Senior Years, we also offer an excellent programme of preparation for pre-tests in Year 6 to an array of selective schools. There are competitive internal and external scholarships available into Year 5, Year 7 and Year 9 for suitable candidates. Our boys benefit not only from a great platform of academic study but also an exciting range of extra-curricular opportunity. There are numerous teams and clubs across Art, Drama, Design & Technology, ICLT, Music and Sport. Additionally, we pride ourselves upon a wonderful selection of day and residential trips, such as the Jersey Tour and an outward bound trip to Wales, during which time the boys develop key leadership skills and cement a team ethic of mutual trust and respect. We are proud that Kingswood House boys join Upper Prep as children and move on to Senior Years as confident, courteous and well-rounded young men. You may download a pdf copy of our ‘Upper Prep Information for Parents’ presentation here. Boys in Upper Prep have the opportunity to go on numerous trips and a residential trip each year. In Year 5 we go to PGL in the Autumn Term, in Year 6 we stay at Walton Firs, Year 7 visit France and in Year 8 the boys enjoy an Outward Bound course in Wales.